Preheat the oven to 400 degrees. Place the roast, after it’s trimmed of fat, in an oiled roasting pan just large enough to hold it comfortably. Coat the meat with 1 to 2 tablespoons of the melted butter and sprinkle with the thyme, sage, and salt and pepper to taste. In a bowl, mix the remaining 4 tablespoons of butter and the garlic. Toss the mushrooms with the flavored butter and then add them to the roasting pan. Roast the meat and mushrooms, basting the meat with the pan drippings and turn the mushrooms twice, until and instant-read thermometer inserted into the center of the roast reads 130 degrees for medium rare, about 1 hour, 20 minutes. Transfer the tenderloin to a carving board, cover loosely with aluminum foil and let stand for 10 minutes. 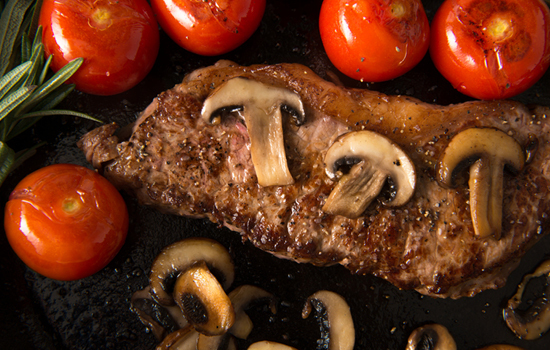 Slice the beef across the grain and arrange on a warmed platter surrounded with the roasted mushrooms. Skim the surface fat from the pan juices and spoon the juices over.